cardigans and kids: a sloppy joe - my favorite recipe. 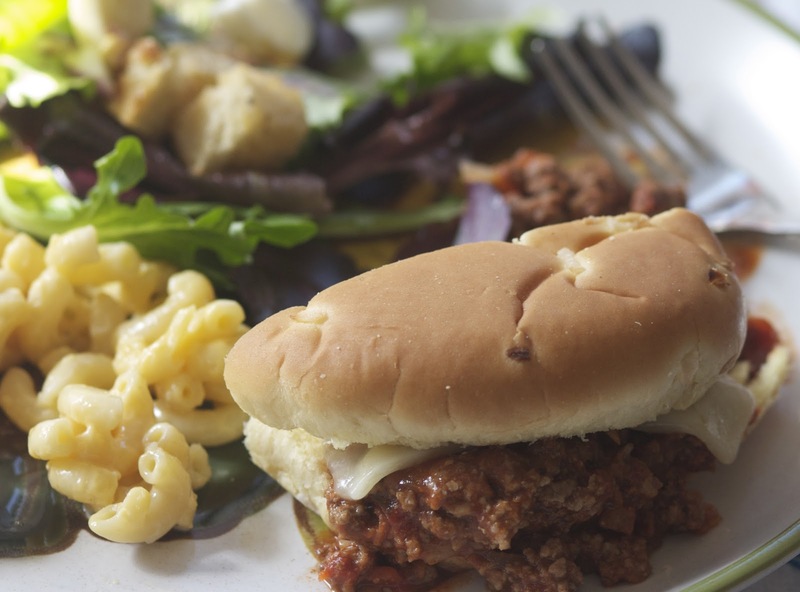 a sloppy joe - my favorite recipe. I grew up eating sloppy joes. I love them. I remember watching my Mom mix the ketchup, brown sugar and mustard in her tupperware measuring cup many, many times. However, my dear husband does not share the same affection for the sloppy joe, and the version I grew up eating are way too sweet for his taste. So, over the years, I have experimented with different canned and homemade varieties, and this one seems to be the most pleasing. Even my pickiest eater will eat them. In a large skillet, cook meat, onion, pepper and carrot until brown. Drain off of fat. Stir in undrained tomatoes, tomato paste, and remaining ingredients, except the extra sea salt, pepper and barbecue sauce. Bring to boiling. Reduce heat and simmer, uncovered for 5-10 minutes. Add the last ingredients and heat until desired consistency is reached. Serve on buns with slices of cheese (and pickles are good too). I would go vegetarian but I could never give up sloppy joes!